1 of 4 Heat oven to 350 degrees F. Coat two 8-inch round cake pans with nonstick cooking spray. Line bottoms of pans with waxed paper; coat with spray; dust with flour. 2 of 4 Mix cocoa, espresso powder, cinnamon and boiling water in cup until smooth. Stir in butter to melt. 3 of 4 Mix flour, baking powder, baking soda and 1/8 teaspoon salt in bowl. Beat eggs in large bowl until frothy. At high speed, gradually beat in sugar until light colored, 5 minutes. At low, beat in vanilla, cocoa mixture, and flour mixture. Divide batter between prepared pans. 4 of 4 Bake in 350 degree oven 20 to 22 minutes, until pick inserted in centers comes out clean and tops spring back when touched. Cool cakes in pans on racks 10 minutes. Turn cakes out onto racks; cool. 1 of 1 Peel banana; cut into 1/4-inch-thick slices. Toss slices with lime juice in small bowl. Set aside with cherries for assembly. 1 of 3 Sprinkle gelatin over cold water in cup; let soften 5 minutes. Combine 3/4 cup heavy cream and white chocolate in small saucepan. Stir over medium heat until chocolate is melted, about 2 minutes. Add softened gelatin; stir until smooth. Transfer to large bowl. Stir in remaining 2-1/4 cups heavy cream and vanilla. Refrigerate 1 hour, stirring occasionally, until well chilled. Beat at high speed until thick enough to spread, about 5 minutes. 2 of 3 Using serrated knife, split each cake layer horizontally in half to make 4 layers total. Place a layer, cut side up, on a platter. Spread with generous 1/2 cup frosting. Arrange 3/4 cup halved maraschino cherries on top. Place second cake layer, cut side up, on top. Spread with generous 1/2 cup frosting; arrange banana slices on top. Place third cake layer, cut side up, on top. Spread with generous 1/2 cup frosting; arrange remaining cherry halves over frosting. Place remaining layer, cut side down, on top. Spread layer of frosting over sides and top of cake. Spread any remaining frosting on top. 3 of 3 Pat toasted nuts onto side of cake. 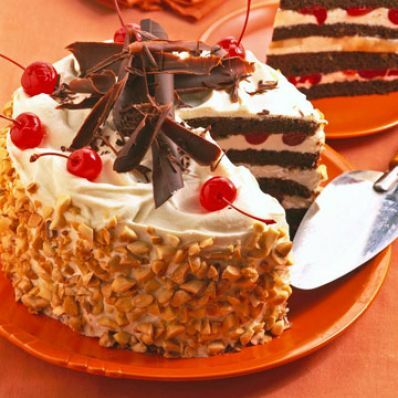 Arrange whole maraschino cherries and chocolate curls on top. Refrigerate at least 1 hour. Makes 12 servings.